Alpha and Beta testing are the Customer Validation methodologies (Acceptance Testing types) that help in building confidence to launch the product, and thereby results in the success of the product in the market. Even though they both rely on real users and different teams feedback, they are driven by distinct processes, strategies, and goals. These two types of testing together increase the success and lifespan of a product in the market. These phases can be adapted to Consumer, Business, or Enterprise products. This article will give you a complete overview of Alpha Testing and Beta Testing in a precise manner. Alpha and Beta Testing phases mainly focus on discovering the bugs from an already tested product and they give a clear picture of how the product is actually used by the real-time users. They also help in gaining experience with the product before its launch and the valuable feedback's are effectively implemented to increase the usability of the product. Goals and methods of Alpha & Beta Testing do switch between themselves based on the process followed in the project and can be tweaked to be in-line with the processes. Both these testing techniques have saved thousands of dollars to large-scale software releases for companies like Apple, Google, Microsoft etc. This is a form of internal acceptance testing performed mainly by the in-house software QA and testing teams. Alpha testing is the last testing done by the test teams at the development site after the acceptance testing and before releasing the software for beta test. Alpha testing can also be done by the potential users or customers of the application. But still, this is a form of in-house acceptance testing. Recommended read => What is Alpha Testing? This is a testing stage followed by the internal full alpha test cycle. This is the final testing phase where the companies release the software to few external user groups outside the company test teams or employees. This initial software version is known as the beta version. Most companies gather user feedback in this release. In short, beta testing can be defined as– the testing carried out by real users in a real environment. Though companies do rigorous in-house quality assurance from dedicated test teams, it's practically impossible to test an application for each and every combination of the test environment. Beta releases make it easier to test the application on thousands of test machines and fix the issues before releasing the application to the public. The selection of beta test groups can be done based on the company needs. The company can either invite few users to test the preview version of the application or they can release it openly to give it a try by any user. Fixing the issues in the beta release can significantly reduce the development cost as most of the minor glitches get fixed before the final release. Until now many big companies have successfully used beta versions of their most anticipated applications. E.g. Recently Microsoft corporation released Windows 10 beta and based on the feedback from thousands of users they managed to release a stable OS version. In the past, Apple also released OS X beta in public and fixed many minor issues and improved the OS based on the user feedback. 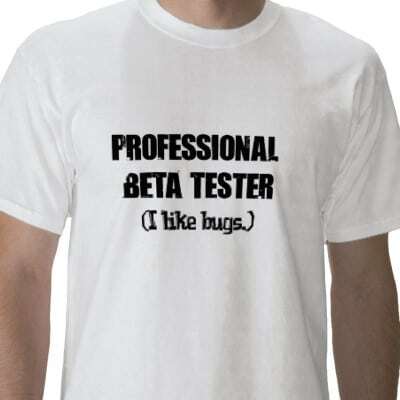 Recommended read => What is Beta Testing? Issues / Bugs are logged into the identified tool directly and are fixed by developer at high priority Issues / Bugs are collected from real users in the form of suggestions / feedbacks and are considered as improvements for future releases. Helps to identify the different views of product usage as different business streams are involved Helps to understand the possible success rate of the product based on real user’s feedback / suggestions. Does the product work? Do customers like the product? Alpha and Beta testing are equally important in any company and both play a major role in the success of a product. I hope that this article would have enhanced your knowledge about the terms “Alpha Testing” and “Beta Testing” in an easily understandable manner. Feel free to share your experience in performing Alpha & Beta Testing. Also, let us know if you have any queries about this article. Key to Successful Unit Testing – How Developers Test Their Own Code? Thanks for the heads up Vijay. I like the approach of adding beta testing experience in resume. Though video game companies pay more it’s difficult to get into. Nice article, i again learned something. Thanks vijay… learned something out of this article..
@ Thanks Jim for one more resource for beta testers. @ all- glad you liked the article. Very nice article. Learned good things from this article. thanks vijay…for the wonderful article it is really working formula for the freshers. These are other crown source testing platforms, but testers should really come up with good skills to make a mark here. Its too good for freshers to test their testing skills. Thanks Vijay Its very much help full for me………may allah bless you…. I have dine that quite a few times…!!!!! This site is really awesome !!! this notes is no any useful for anyone very bad…..
can we get more and money by investing $250. Great article. this is nice site for increasing our testing knowledge. thanks for sharing testing information, it really helpful.